This is my true life story in Malaysia as a teacher & I will tell it as it happened without frills & thrills or sensationalism. It will however reflect the strong & principled character of a young man in his audacity of doing the right thing, irrespective of whom he was dealing with. Edward (not his real name) was a nice young lad, tall & slender with a handsome smile. It was a delight teaching him. He always produced the neatest work you can ever expect from a class of 25. His handwriting was like print, and his assignments were excellent. He was a straight A student with a tremendous future ahead of him. He almost didn’t get to complete his sixth form studies (pre-university level or Higher School Certificate as is known in UK). This was on account of the fact that he was from a poor background, his mother had to wash clothes for people to support him in school. I was literally disgusted with the whole issue of meritorious fairness. The way of allotting scholarships to needy & worthy students by the Malaysian government was grossly unfair & unjustifiable, apart from the simple glaring fact that it was utterly discriminating on ground of colour & race. What sickened me the most was a good many students in my class were bright but poor & certainly could do with some financial aids. They were excluded simply because they were not “sons of the soil” (bumiputra) even though they might be born & bled in the country – and that could mean stretching from one generation to the next. Without exaggeration, the top students in the class were all the non-scholarship holders, while those at the lower end of the scale & holding scholarships were a wonder how they got admitted to the sixth form in the first place. It is a known fact that even today the Malaysian government set a lower criteria for entry for these privileged students. I am speaking of my time then in the mid-1960s. Inwardly, I had realised the plight he was in, and I said, “Don’t worry. We’ll find the solution if that’s your only problem. Just stay on.” Somehow that problem was later solved. As the form teacher, there are certain responsibilities which you bear that those relief or subject teachers don’t, for instance, keeping the students’ records, attendances & providing them with testimonials upon their graduation. Now with Edward who topped the class, he was unbeatable in virtually every other respects, except for sports & athletics. So, in my book, he was the dux deserving an excellent testimonial. However, the principal of Anderson School, Ipoh, a premier government school, was a man who was most difficult to get along with. He was authoritative, arrogant and always prowling around, spying & ready to pounce literally like a “tiger” on teachers who were slack or shirking in their duties. His relationship with me was far from civil or polite, to say the least, ever since he noticed my brand new Volvo 122S (1967 Model) parked in the school. It was a creamy colour 4-door sedan – something he vowed not a possibility for a brand new graduate to own, that is, if he had to depend solely on his teacher’s salary. I was really a young man in a hurry during those days. I didn’t just get income from my teaching school alone, I worked full-time, part-time, past-time & part-past-time for most times in other areas of human endeavour. For instance, I had the energy for teaching Further Adult Education classes at night, lecturing teacher-trainees (R.T.C.) during the weekends, engaged in lucrative part-time life insurance sales with Prudential . . . all generating the extras for my extras. Finally, by the time my teaching contract bond with Education Ministry expired, I had decided to put both my two feet into the challenging field of life insurance sales with AIA (of the now AIG fame). That was the time, I burned my academic bridges behind me . . . I was also utterly sickened with the state of education affairs of fairness & discrimination. Besides if you have one foot in the fast track travelator while the other is on a snail track, you’re likely to be dislodged. That was the year 1970 when I quit my teaching life as the Sr. Geography Master. On this account, Mr “Tiger” was unhappy about having one of his subordinates having something better than his. It was obvious from that day onwards he was trying to make my life miserable & intimidating. One aspect of it was he wanted me to always address him as “Sir”. “With due respect, I am being more than polite addressing you as Mister. If you were in the medical profession, it’s a tremendous honour to be addressed as such. For unless you’re a surgeon, you’re commonly addressed as Dr. only,” so I told him. The Sr. Assistant of the school was my friend & supporter, he was listening with great interest to the squabble we were having. When I came out of the office, he was giving me the thumb up & a broad smile, as did some of the other staff. There was no love lost between me & Mr. “Tiger”! In the end, after all the aggravation, he signed the testimonial for my boy. The last I saw Edward was at Hong Kong & Shanghai Bank in Petaling Jaya & it was gratifying to know that he was a top executive officer of the bank – a position he might not have had were he not able to finish school & got on to the university. That must have been in 1982, the year when my whole family migrated to Perth. This is Chin Fook Leong, your student at Anderson 66-67 (Sixth Form). I came across your website and saw the photo posted there. Well, this was my class the Upper Six in 1967. I am the 3rd guy in the photo ,next to the Econs teacher, Selvamany. I can recall some of my class mates, Ahmad Sarkawi, Wong Poh Lam, Yeong Sek Yee, Qua Gek Kim, Rashidan, Too Poh Yik, Neeta Sham Singh, Wan Ahmad Kamal but could not recollect the others. 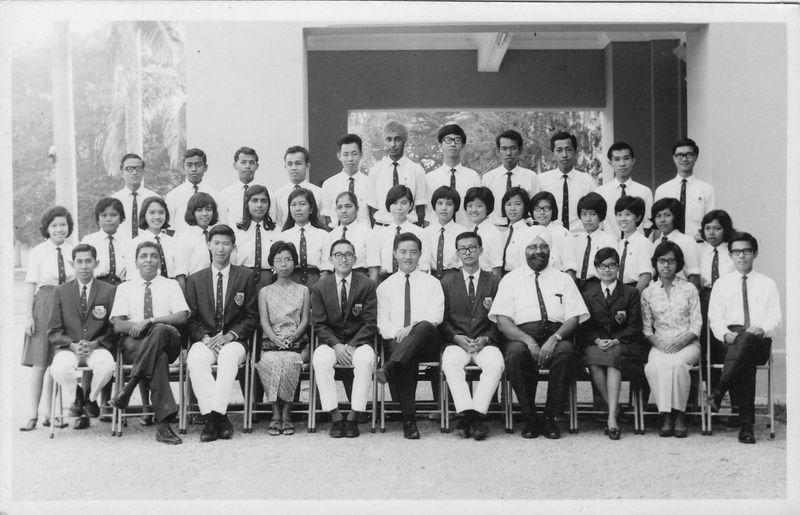 The teachers then were Monica Leong, Waryam Singh, of course you, P Chong, Selvamany and the principal, Tagar Singh and Eddie Chin…cannot remember the Malay lady sitting next to Eddie. Keep up you posts. It nice to read them.